Demonstrating honesty and sincerity in all of our dealings. Upholding only the highest ethical principles. Making decisions that reflect the highest standards of proper stewardship and accountability of resources. Projecting professionalism in everything we do. Being accountable for our actions. Delivering every product and service in an outstanding manner. Showing pride in our efforts and the community in which we live and work. 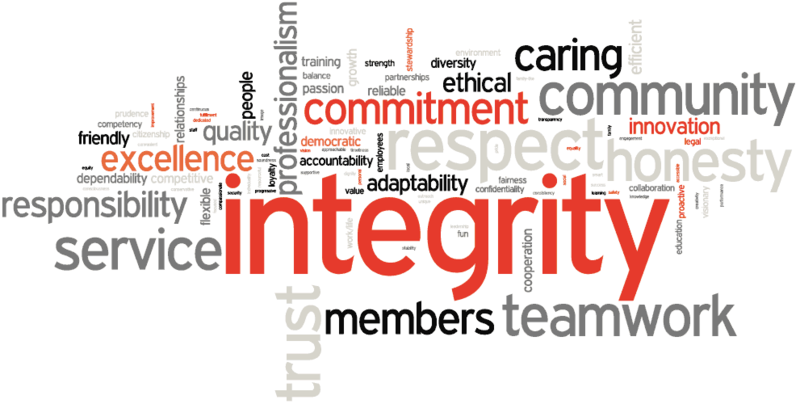 Working in full cooperation and mutual support that inspires trust, loyalty, and respect to achieve a common goal. Creating and maintaining a spirit of service. Showing consideration or regard for an individual or institution. Assessing all people on their merits. Valuing diversity and accepting individual differences.